When I was a kid, most salad ingredients lived in the pantry in my house. Mum was a great cook, but always looked for shortcuts. So, salads consisted of iceberg lettuce and tomato wedges and everything else came from cans. Pineapple, pickled cucumbers and beetroot were the norm. When I look at what I grow in my vegie garden now, 95 per cent of it didn't exist in my world back then. Thank goodness for the migrants who made the trek to our shores, bringing with them fabulous cuisines and different ways of life that considerably broaden our horizons. Today's recipe is as far removed from my childhood meals as it could be. 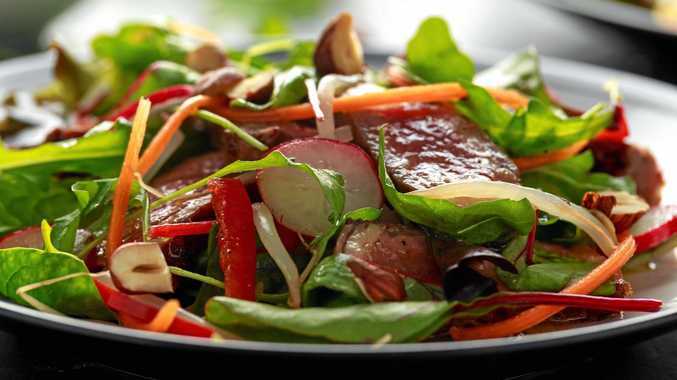 Rare roasted beef is marinated in a spicy dressing then added to a wonderful mix of fresh salad goodies to create a delicious Thai-style beef salad. Not an iceberg leaf in sight. Preheat oven to 210C. Rub meat with olive oil and season with pepper. Place in a baking tray and roast at 210C for 20-25 minutes, or until cooked to your liking. Transfer to a plate, cover and rest for 15 minutes. Place coriander leaves, garlic, kecap manis or soy sauce, lime juice, fish sauce and brown sugar in a blender or food processor and blend until smooth. Slice cooled beef as thinly as possible with a sharp knife and toss in marinade with the mint leaves. Divide vegetables among six plates and top with beef. Garnish with almonds. Serve immediately.